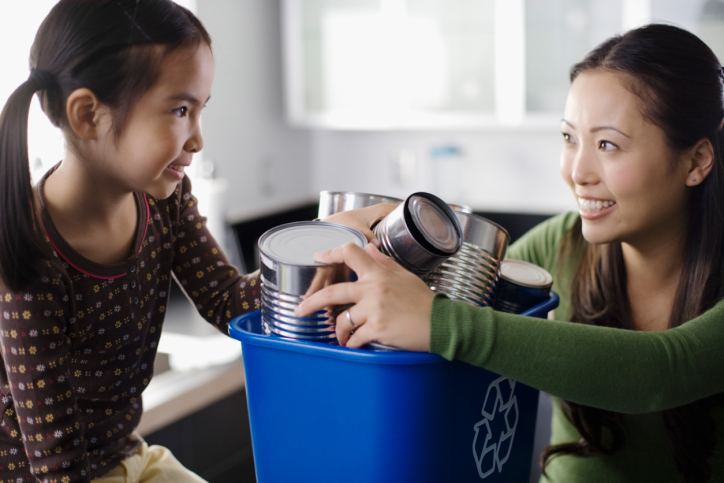 Establishing a daily recycle plan isn’t just a great way to save the environment – it can also be a fun and educational activity if you get the whole family involved. Here are just a few of the most effective tips for creating a more eco-friendly world, one aluminum can at a time. Your first step in your daily recycle plan should be to get yourself educated on where your local recycling centers are, what kinds of recyclables they accept, and what their particular rules are. The Yellow Pages is a great resource. Of course, there’s always that new-fangled invention called the internet that can get you the same information without having to hoist that hefty phone book onto your kitchen counter. Speaking of those enormously voluminous phone books, did you know that they’re 100 percent recyclable? So are many of the paper products you use in your home, from newspapers to magazines to all that junk mail you get on a regular basis. But not every kind of paper is recyclable, so it’s important to separate what will work from what won’t. Avoid waxed paper and laminated documents. Also, be sure to keep your pile of recyclable paper separate from used napkins, paper towels, or tissues. Aluminum is one of the most recyclable materials on the planet. Kick your daily recycle routine into high gear by getting a separate container in which to store your used aluminum cans, aluminum foil, and even scrap aluminum. So get busy collecting all those discarded soda cans, and enlist your kids as foot soldiers in your mission to make your environment as eco friendly as possible, and get compensated for recycling. It’s easy to want to be eco friendly, but it’s another thing entirely to be effective at it. Without a game plan in place, and without the participation of every member of your family, your daily recycle plan won’t be nearly as impactful as it could be. Consider setting aside some time to discuss this plan with your entire family. Make an evening of it – order a pizza and gather around the kitchen table and have yourself a bona fide brainstorming session. Doing so will get the kids excited about making positive change, and will make the job of managing your efforts that much simpler.